Do you need a fast disk-based backup and recovery solution that can grow with your business? 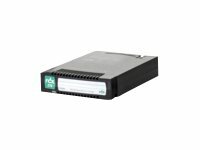 The HPE RDX Removable Disk Cartridge is a rugged cartridge style hard disk drive. When paired with an internal or external docking station to provide easy off-site data protection and quick access to your most critical data. Backups are simple with drag and drop file access and fast disk based performance (up to 360 GB/hr). There is a choice of disk capacities ranging from 500 GB, 1 TB, 2 TB, 3 TB and 4 TB of data in a single cartridge. These long lasting removable disk cartridges are forward and backward compatible with all the HPE RDX USB 3.0 Internal and External Docking Stations, lowering your overall cost of ownership. The HPE RDX Removable Disk Cartridge is designed for over 5,000 load and unload cycles and designed for long life expectancy. Cartridges are tested to withstand a drop of 1 meter (39.4 in) making them more reliable for easy transport and store off-site for disaster recovery. These rugged, portable cartridges protect the hard drive inside supporting making transporting data between locations easy and more reliable. The HPE RDX Removable Disk Cartridge has built-in static protection reducing server failures due to statically charged peripherals. Supports disk spanning so backup data can continue to grow across multiple cartridges. Fixed disk mode capabilities offering easy server operating system integration in a small business environment. Each HPE RDX Removable Disk Cartridge is qualified and tested making it easy to integrate into your server, storage and networking environments. Compatibility across various operating systems and virtualization platforms makes it simple to adapt into any small business environment. Fixed disk mode capabilities offering easy automated backups via the native Microsoft Windows OS.